17 weeks pregnant. Not much to see yet. 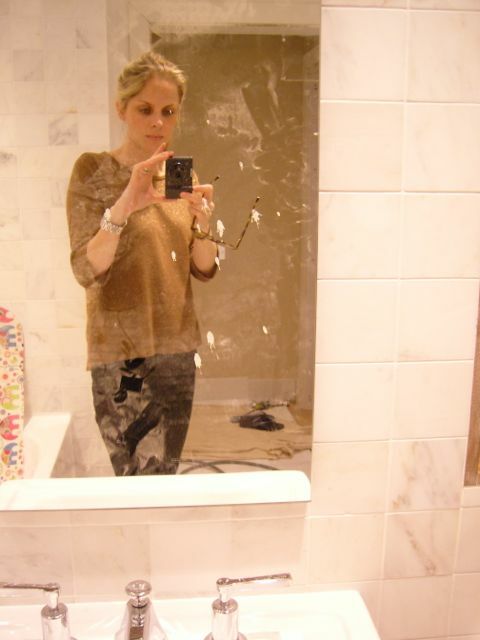 Dust on mirror curtesy of messy builder. It’s bizarre how much more “actively pregnant” I felt with little L – I read baby books, went to antenatal classes and sang for my unborn baby in pregnancy yoga. The whole thing was much more on the top of my mind, whilst right now, it’s just not. Although I am a not necessarily unhappy that this second pregnancy isn’t taking over my life in the way the first one did (I was a complete and real bore, hardly able to speak about anything else), I am also feeling a little bit guilty that this baby isn’t getting the same amount of attention the first one got. As much as I’d like to, I can’t really blame it on being distracted by living on a building site. I have been in the exact same situation before – we moved into our far-from-ready house when I was 18 weeks pregnant with little L. However, I might be excused to have temporarily forgotten even the pregnancy-induced sciatica pain when a rat took over our kitchen last weekend. Raising my concerns to my consultant, he laughed them off, stating that a whole array of “neglected second children” are doing just fine. Apparently, they find their way to make themselves heard. So, tell me mums of two or more children. How loud does the second one scream? So funny I am literally just one week ahead of you. I officially can’t wear my skinnies anymore though! I haven’t really felt pregnant this time so too suprise myself when I remember there’s a bun in there! I have a boy and girl with 4.5 yrs between them and I always think I have a very typical girl and a typically active little boy….I don’t think you can generalise. My daughter is a “typical” sensible, cautious and conscientious eldest child – and my son has all the confidence that I think a second and younger child often has. (Interestingly my own brother and I were just the same). My son embraces everything and is a total ray of sunshine – not to say my daughter isn’t, she’s just quieter about it!! I think during your 2nd pregnancy, you just relax a little more – even if subconsciously….and when you also have a toddler to look after, you just can’t always be as focused as during the 1st pregnancy. One thing, I would say is that I know very few 1st and 2nd children with similar personalities….a quick mental straw poll of friends makes me think that 2nd children are often easier. On the other hand, I think “middle” children are the biggest handfuls of all!! My brother certainly was – you don’t get away with what the youngest does and you don’t always get the attention that the eldest does – so you have to get attention with your behaviour!! Unfortunately I was very aware of the 2nd pregnancy as we thought there was something wrong from about 5 months on, (there wasn’t) so it was constantly on my mind. However, when he was born, we discovered that although my husband remembered to bring the camera to the hospital, there was no film in it! (1995) As is typical with many 2nd children, there aren’t any photos of him until he was about 3 days old. He talks a lot less than his elder sister and younger brother, but that’s ’cause there’s not a lot of air left in the house! The way I found to connect was preparing for birth with hypnotherapy. Every evening I would listen to my mp3 blocking out everything else. I am sure it helped me or I would have been in shock giving birth because the rest of the time I didn’t have much time to think. sister grabbed all the attention the minute she was born. Based on my experience the second is the loudest, although as a baby he was like E a fairly calm and quiet baby. Don’t feel guilty about it though, it happens but when the baby is born it all falls into place. The second one screams just as loud, but the difference is it doesn’t stress you out as much. All those things you found terrifying as a new mother – changing the first nappy, colic, spitting up – just seem like routine, second time round. (I remember that second pregnancy feeling, too – you just don’t have time to read the baby books or anything else because you’re busy running after the other one. ) You’re looking well on it! Love this…too funny on the skinny jeans comment! I also distinctly remember saying to the nurse at his immunisations how he was such a good baby (apart from those nights…). She replied ‘yes, it’s around the year mark that the second borns tend to start causing trouble’. How right she was! At around 12 – 18 months his personality began to come through and he went from being a quiet, placid thing to a very headstrong, confident and loud little boy! I’ve heard that second children often try to differentiate themselves from their older sibling – I would certainly say that my two are very different. My second is as cheeky and naughty as my first is sensible and well behaved! I am now wondering how my third will will turn out! It is endlessly fascinating and one of the joys of parenting, seeing your children develop into into their own little person. Congrats! Kids are a lot of fun! Enjoy this special time every second. The second one puts over-parenting totally into perspective. They do everything so much faster, because they have an older sibling. That makes you realise that a toddler or preschooler is actually a better role model than you are.Humbling! Oh my goodness, the second child will make themselves heard, count on it! My first was a little angel, he would fall asleep anywhere, anytime. You would only hear from him if he was hungry, and even then, it wasn’t a cry, more of a loud sigh. My second child, well, his screams can literally cause your ears to ring! He is boisterous, loveable, full of personality, but lord help you if he feels like he’s being left out!